The Swiss luxury watch manufacturer IWC honors one of the most famous pilots in history, Antoine de Saint-Expuéry, with different pilot's watches. The Frenchman became world famous as the author of the beloved children's book, The Little Prince. The Saint-Expuéry watches from the International Watch Company (IWC) don't form their own collection. 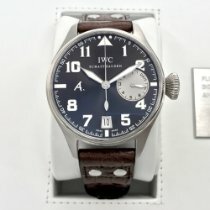 Instead, IWC spread these watches out over different series. The timepieces are all pilot's watches, but their complications, designs, and prices vary. Some models even have extremely rare complications. A good example of this is the Double Chronograph Edition, which has three push-pieces. Watches of this type have two stopwatch second hands and are nicknamed dragging counter-hand chronographs. You can start both simultaneously by pushing a push-piece. One of the hands can be stopped by the third push-piece in order to allow you to time an interval while the other hand continues to move. By pushing a push-piece again, the stopped second hand catches up with the running hand. This is also called a rattrapante chronograph. The Pilot's Watch Double Chronograph Edition "Antoine De Saint-Expuéry" (IW371808) is limited to a run of 1,000 pieces. The watch's color palette is dominated by a tobacco brown; both the dial and calfskin leather strap are this color. The watch acquires a bit of a vintage look thanks to the contrasting cream stitching on the strap. The 44-mm stainless steel case has a thickness of 17 mm and is waterproof to 60 m (6 bar). If you take a look at the case back, you immediately see the relationship between the watch and the French aviator and writer. The case back features an engraving of a Lockheed F-5 from a bird's eye view. Antoine de Saint-Exupéry flew this plane during the Second World War as well as when he died on July 31, 1944, most likely shot down by enemies. Technical details of the watch, as well as the words Edition Antoine de Saint Expuery, are engraved around the plane in a circle. Most of the Saint-Exupéry watches are chronographs, although there is also a perpetual calendar model (IWC503801). With a diameter of 46 mm and a thickness of 15.5 mm, it's a rather large watch. This particular edition is limited to a run of 750 pieces. There's also a Big Pilot version in red gold (IW502617) with a perpetual calendar that's also dedicated to Saint-Exupéry. It's limited to 500 pieces. The date, day of the week, and month are displayed on subdials. There's also a moon phase display beneath 12 o'clock as well as a four-digit year display in a rectangular window between seven and eight o'clock. The dial also features a power reserve indicator. The automatic movement used is the in-house caliber 52610. It has an impressively long-lasting power reserve of up to seven days. This watch also features a tobacco brown dial. However, unlike the double chronograph version, the perpetual calendar version has a see-through sapphire glass case back that allows you to watch the movement in motion. The red gold rotor is engraved with the words Edition Saint Exupéry. A simpler Saint Exupéry Pilot's Chronograph (IW387806) with only two subdials at 12 and six o'clock is also available. The off-white subdials stand out in contrast with the tobacco brown dial. The case has a diameter of 43 mm and a thickness of 15 mm, and its case back features an engraving of a Lockheed F-5. The caliber 89361, which features a flyback function, powers this timepiece. Another version of the Saint Exupéry Pilot's Watch features a large power reserve display at seven o'clock and a date window at three o'clock. The window is large, allowing space for it to display the date from the day before, the current date, and the next. Otherwise, this is a simple three-hand watch. The 44-mm watch is no longer produced and was limited to 1,178 pieces. 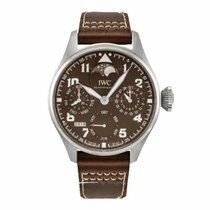 The IWC with reference number IW326104 is also a 44-mm Saint-Exupéry. It has a distinctive semicircular UTC window. The acronym UTC stands for Universal Time Coordinated, the primary time standard which the world uses to regulate their clocks and watches. Informally, it's still known as Greenwich Mean Time. The timepiece displays UTC time at six o'clock; the letters UTC are also printed next to the window. How much does a Saint Exupéry watch cost? 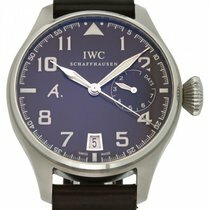 The last three watches mentioned, IW387806 (chronograph), IW320104 (power reserve display), and IW326104 (UTC display) are IWC's entry-level Saint-Exupéry timepieces. You can purchase them for around 4,000 to 5,000 euros. Pilot's chronographs have the potential to cost significantly more. If you want a new stainless steel pilot's chronograph, you should expect to spend at least 8,000 euros. If you prefer a rose gold version (IW387805), then the price is around 15,000 euros. 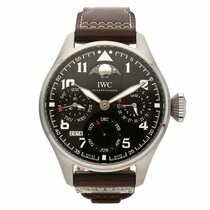 The double chronograph (IWC371808) starts at around 9,000 euros. It's one of IWC's most appealing pilot's watches for those who enjoy intricate calibers and complications, seeing as it has a rattrapante chronograph. This applies to the chronograph with a perpetual calendar and moon phase display as well; it costs around 20,000 euros. The gold version is even pricier at 35,000 euros and is the most expensive Saint Exupéry watch. Saint-Exupéry became famous not just for his literary works, but also his tragic end. He had already survived a crash in the desert in 1935; he worked through his experiences in The Little Prince, which was published in 1943. In the Second World War, Saint-Exupéry sided with the Allies and fought with the Free French Air Forces. On July 31st, 1944, Saint-Expuéry took off from Corsica on his ninth reconnaissance mission. He flew a Lockheed F-5, an unarmed version of the US fighter aircraft P-38. The most likely explanation for his disappearance is that a German fighter pilot spotted him over the Mediterranean Sea and shot him down. Saint-Exupéry was considered missing with his fate undetermined; even suicide wasn't ruled out. In 1998, a fisher randomly found a silver bracelet engraved with the names of Saint-Expuéry and his wife. His plane's wreckage was also discovered. In 2008, a reporter came into contact with a 64-year-old former German fighter pilot, Horst Rippert, who claimed to have shot down the Lockheed F-5. In the years after the war, he made a career for himself as a sports reporter. He had remained silent for years about the shooting in order to avoid any blowback. He stated that he had always admired Saint-Exupéry. Rippert died in 2013. There's no way to determine if he was telling the truth or not, although a lot of his story makes sense and no one has disproved his claims.